Thanks To Indian Railways! 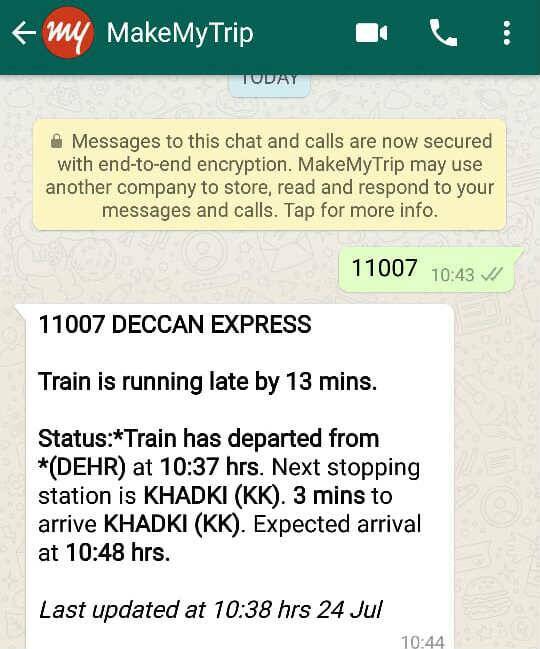 Now whenever you are traveling or stuck in traffic, you can easily check your train status on WhatsApp. Indian Railways, associated with MakeMyTrip, will provide you information regarding all the trains through status updates. It will include booking statuses, train departure, and arrival timings, cancellations, platform number on which the train will arrive and much more. So How To Use This Indian Railways Facility? 1. First of all, save the phone number 7343989104 (MakeMyTrip) on your mobile phone. 2. To get the update about the train, send your train number on the number above. After sending the train number, you can expect a response within 10 seconds if the server is not that much busy. Check your message for the blue ticks and make sure your internet is active. The updated IRCTC website allows you to log in without id and password and has a new “Waitlist Feature” and allows you to save up to 6 cards to process with transaction easily.